Mr. George " Rocco" Cameron, 46, of 258 Norrington Rd, Lillington, NC, passed away on Friday, February 1, 2019, at Cape Fear Valley Hospital, Fayetteville, NC. Friends are being received at his home. Rocco leaves to cherish his memories wife of sixteen years, Candace Mungo Cameron; their seven children, Kiara, Shayla, Devonte, Albert, Maya, La’Aria and Leandra; three grandchildren, Jeremiah, Rena’marie, Noah (and two on the way); his mother, Isabelle Smith; in-laws; Al and Mary Mungo, eight sisters, Cassandra (Archie), Jackie, Phaulethia (Joseph) all of Erwin, NC; Paulette (Dennis), Elizabeth (Tracy), Teresa (Paul) all of Dunn, NC; Pamela of Bunnlevel, NC; Alfreda (Keith) of Winston– Salem, NC; and a host of aunts, uncles, nieces, nephews and many friends. 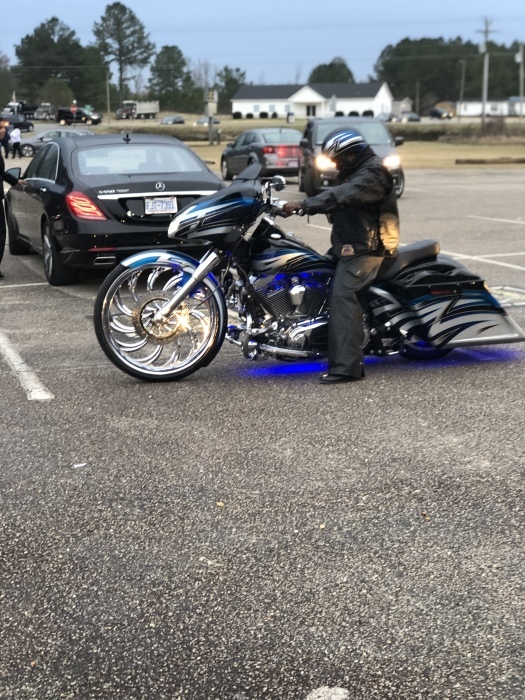 Viewing for Rocco will be held on Sunday, February 10, 2019, from 2:00 p.m. to 3:00 p.m., Funeral Services following the viewing, beginning at 3:00 p.m.,Cape Fear Conference “A” Headquarters, 25 Beaver Rd, Erwin NC. Interment will take place immediately after the service in Riverside Community Cemetery, Erwin, NC.